The plant family of Cucurbitaceae consists of squashes, gourds and melons. Pumpkins, cucumbers, zucchinis, watermelons and bittergourds are all relatives under the family of cucurbits. This week, I'm going to feature 3 different cucurbits and my favourite ways of cooking them. I love luffa or some call angled loofah or even ridged gourd. It has a beautiful sweet flavour and gives out a wonderful aroma when stir fried over high heat. Every family will have their own way of doing this and this is the way that I personally like it to be. Just make sure you use high heat to stir fry the luffa, until some caramelization has taken place, if not, it won't be as nice. Simple and delicious. I love this. 1. Soak cloud ears until it expand, and trim the the base to remove hard bits. Soak glass noodles until softened, snip them into 2-3 inch lengths. 2. Soak dried shrimp for 5 minutes, drain. 3. Peel angled loofah, rinse loofah and cut into slanting pieces. Do not wash after cutting. 5. Heat a wok and put in some cooking oil and sauté garlic until fragrant, then put in dried shrimp and cook until the garlic looks slightly golden. 6. Put in angled loofah in and cook until some sides look golden and it smells fragrant. 8. Pour egg white over and give it a gentle toss. Dish up. 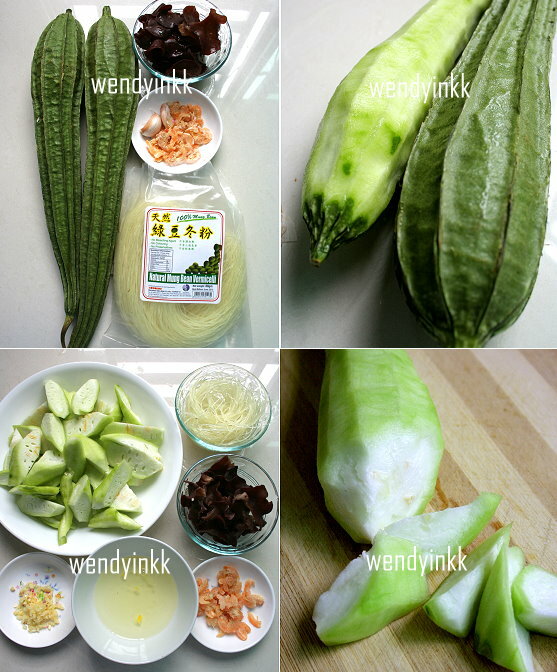 Never thought of luffa can be cooked this way. i always cook it dried shrimp or egg. Ok, i must bookmarked this. Oh....this is my favourite dish; very frequent too I cook the same ingredients like yours! 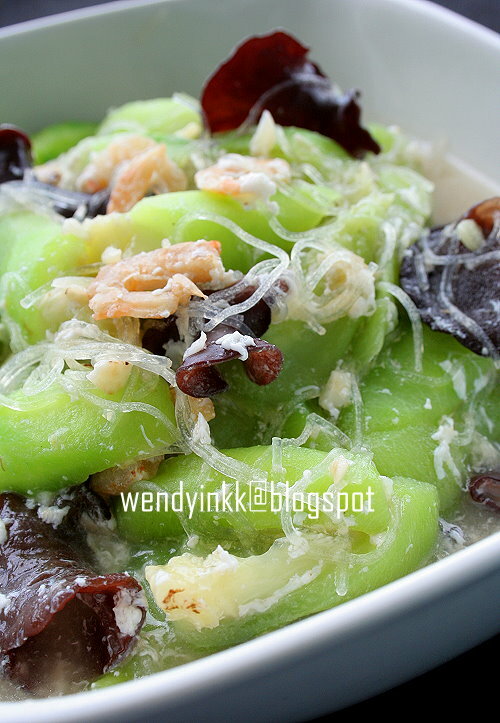 This is the kind of dish I grew up having at Granny's place. Great with rice! 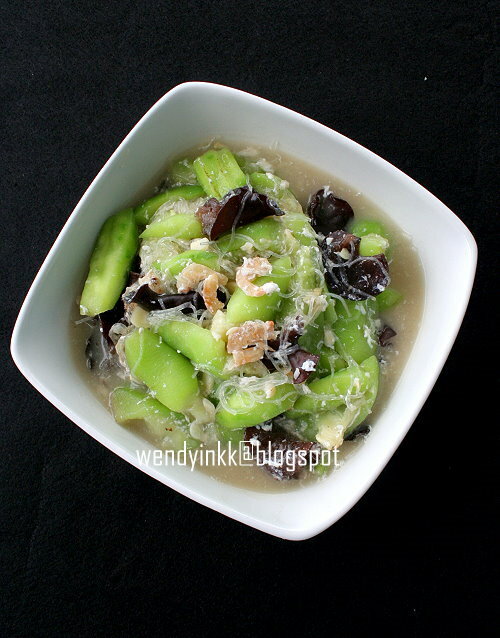 I love this simple homey dish too, we make it in a very similar way. U're from Sains Pertanian at UPM? The dried shrimps make this even sweeter. I love to eat this by itself without any rice too..nice. oh yesss !! I love the quality of your pictures ! good night :) kisses from Belguim.. 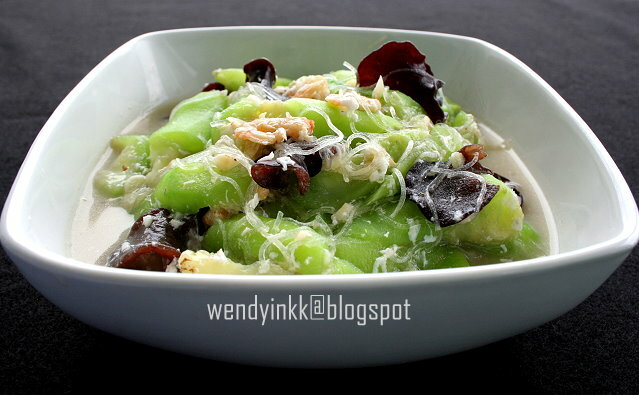 I like the texture of luffa and this looks like a very comforting dish! One curious question...any particular reason why only egg white is used? Thanks! Lovely shots and I learnt a new word today, hahah...at first glance, I thought you mean "bits of cucur as in cucur udang ", silly me. You can use a lot of things to subsitute. Dried cuttlefish, dried scallops, minced meat, ikan bilis or even crab sticks. If u want to use salted egg also can. Thanks Wendy. My kids love this dish very much! !